What’s Next is known for bringing the latest research to the Summit community to help you better understand the elements of the longevity economy. January 16th, AARP released 2016 Caregiving Innovation Frontiers. Caregiving – the need for “informal” care usually by a family member – results from people living longer lives and their desire to age in their own homes. The number of people requiring care will grow from 40 million in 2014 to an expected 117 million in 2020. This new report identifies the issues, opportunities and the technology tipping point. 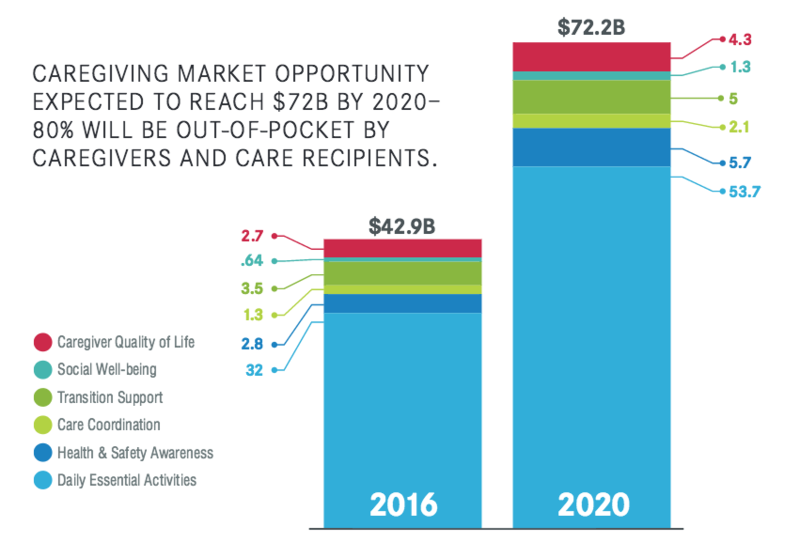 The financial opportunity, as illustrated above, is expected to reach $72 billion in 2020. The cumulative total from 2016-2020 is expected be $279 billion with $60 billion out-of-pocket for the caregiver. One of the most popular features of What’s Next is the Ask the Analysts session. Slated for 9 a.m. Laurie Orlov will moderate The Business and Policy of Caregiving panel, featuring Nancy LeaMond, AARP; David Inns, Great Call; and Sherwin Sheik, Carelinx. Read more about this session.